eDocAmerica Weekly Health Tip: What is the DASH Eating Plan? Recently, U.S. News and World Report released its ranking of the best diets for 2014. This list was compiled by a panel of health experts including nutritionists and physicians specializing in diabetes, heart disease, and weight loss. In this ranking, the DASH eating plan topped the list, beating out better known diets, such as the Mediterranean, Jenny Craig, and Mayo Clinic. How could a diet with an acronym that stands for “Dietary Approaches to Stop Hypertension” have received the highest overall ranking? Is lower in sodium (salt) than the typical American diet. By following the DASH diet, many people with hypertension have been able to lower their blood pressure readings by several points. But in addition to helping with blood pressure control, the DASH diet is consistent with the current dietary recommendations for osteoporosis, heart disease, diabetes, and cancer prevention. Grains---bread, cereal, rice and pasta. Whole grains are encouraged since they have more nutrients and fiber than refined grains. Examples include brown rice, whole-wheat pasta, and whole-grain bread. Fruits---apples, apricots, bananas, dates, grapes, oranges, melons, peaches, pineapples, raisins, strawberries. Canned fruits or fruit juices are thought to be OK as long as no sugar has been added. It should be noted that certain fruits, such as avocado and coconut are fairly high in fat (and calories) than most others. Vegetables---broccoli, carrots, green beans, green peas, kale, lima beans, potatoes, spinach, squash, sweet potatoes, tomatoes. Like fruits, vegetables are important sources of potassium, magnesium, and fiber. Fresh, frozen or canned are all acceptable choices although the sodium (salt) content of canned foods should be taken into consideration. Dairy---milk, yogurt, cheese. These are major sources of calcium, vitamin D and protein. 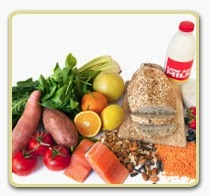 In general, low-fat or fat-free should be chosen. Many fat-free cheeses, however, can be high in sodium which should be avoided. Lean meat, poultry and fish. Lean cuts of meat with the fat trimmed away are recommended. Skin should be removed from chicken. Eating fish that are high in omega-3 fatty acids (e.g. salmon, herring and tuna) is encouraged. Broiling, roasting or poaching rather than frying is encouraged. Nuts, seeds and legumes---Almonds, peanuts, walnuts, sunflower seeds, peanut butter, kidney beans, lentils, soybeans, split peas. These are rich sources of magnesium, protein, and fiber. Meals centered on beans, lentils or soybean products are encouraged as a substitute to meat-based meals. Since nuts are fairly high in fat, they should be eaten in moderation. Fats and oils--- The DASH diet limits fats to 27% or less of daily calories including fat in foods and added fats or oils. Mono- and polyunsaturated fats are recommended over saturated fats. Common sources of these healthier fats are vegetable oils (canola, corn, olive, and safflower), low-fat mayonnaise, and light salad dressing. Saturated fats from meat, butter, cheese, whole milk, lard, and “tropical oils” (palm and coconut) are limited to less than 6% of total calories. Trans fat, a major cause of elevated blood cholesterol should be avoided. Sweets---Unlike many diets, the DASH plan allows for eating sweets. The key is moderation and portion control. Artificial sweeteners (NutraSweet, Equal, Splenda) are recommended sparingly. Serving sizes of each of these vary depending on the specific group. One “serving” of meat is considered to be one ounce. A “serving” of sweets could be 1 tablespoon jam, ½ cup sorbet, or 1 cup lemonade. The number of servings from each group depends on the daily caloric requirement which is based on age, gender, and activity level. As an example, a young woman who is moderately active would be allowed to eat up to 2,200 calories per day. This could include up to 8 servings of grains, 5 servings of fruits, 5 servings of vegetables, 3 servings of dairy, 3 servings of fat and oils, 6 servings (approximately 6 ounces) of meat, 5 servings (per week) of nuts, seeds and legumes, and 5 servings (per week) of sweets.